Performing Diaspora artists represent many of the state’s most exciting new voices at the intersection of traditional arts, contemporary performance and California’s changing demographic. In the second festival weekend, Laura Inserra, Muisi-kongo Malonga and Nadhi Thekkek excavate their own heritage and push the boundaries of their current practice, exploring themes of resistance, spirituality and love. Due to a death in the family, Jewlia Eisenberg will not be able to perform in the festival. One of Jewlia’s collaborators and performers, Laura Inserra, an internationally acclaimed Hang player, will offer a performance in her place. Laura Inserra is a classically trained musician with a strong background in improvisation and minimalist music. An internationally acclaimed Hang player, Laura has collaborated with various artists globally. 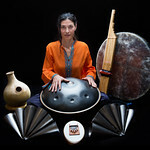 Her performances display ancient and modern instruments and are infused with a unique blend of musical inspiration and melodic harmonies. Muisi-kongo Malonga’s Kimpa Vita! 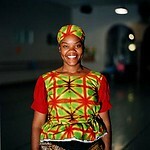 is a music, dance and theater narrative told through the dual lens of Congolese and African American cultural arts traditions, exploring the controversial life of Congolese prophet, Mama Kimpa Vita. The Cloud Messenger by Nadhi Thekkek and Nava Dance Theater is a Bharatanatyam adaptation of the poem, Meghadhootha, by 5th century Indian poet, Kalidasa, showing why love’s journey, though risky, is indeed something beautiful.